Koh Samui is a tropical Island located just off the east coast of the Kra Isthmas in the Gulf of Thailand. It is approximately 88 square miles and has a population around 65,000. 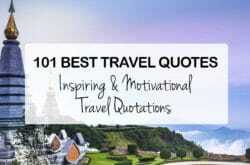 There are lots of beaches, coral reefs, coconut trees, historical sites, and tourist attractions to explore. 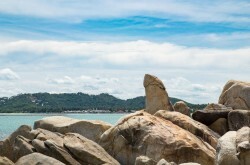 Koh Samui has been a populated Island for fifteen centuries, fishermen coming from the Malay Peninsula and Southern China being some of the first settlers. Later in the 20th century people from Thailand and worldwide began to emigrate here. For most of its existence, Koh Samui was an insular community which had little to do with the mainland Thailand. It was self-sufficient although sparsely populated. This changed in the late 20th century, when roads were built in the early 1970s. Prior to that, the nine-mile journey from one end of the Island to the other had to be made by trekking through the mountain jungles. Koh Samui has grown an enormous amount, and is now mainly a tourist industry run economy with rubber and coconut exports, and there are modern roads. The Island is surrounded by sixty other Islands. On its shores, it still has areas in the centre of the Island, which are tropical jungle and the mountain known as Khao Pom which peaks at 2,083 feet. There are also coastal areas and lowlands, which are now connected by a road which stretches 31.5 miles around the area. The original capital of the Island, Nathon, is located on the northwest coast. While it is a major port, Nathon is a small and less populated area. You will be happy to find that Koh Samui can offer you a tropical savanna climate. There is a dry season which lasts about one month, and that is February. In February, the precipitation falls below 2 inches, which is considered a tropical dry season. The other months of the year Koh Samui is warm and humid. Compared to the majority of southern Thailand, Koh Samui is one of the driest. The heaviest rain of the year is generally through October and November. The rest of the year, 20-60-minute rain showers are the usual. 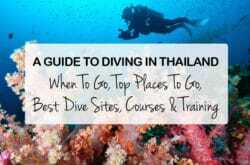 Below you can find some of the top places to go on the beautiful island of Koh Samui. 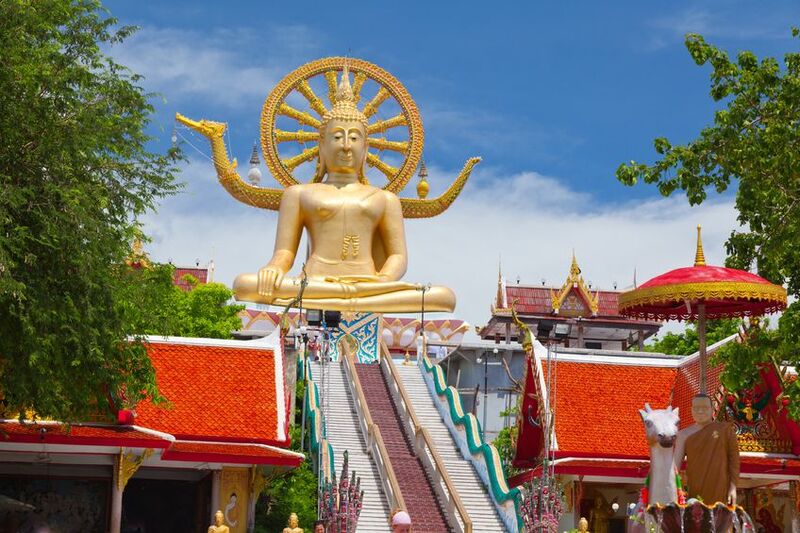 Also known as Wat Phra Yai, the Big Buddha Temple is accessible to the public via a causeway from its small Island, Koh Faan, located North Eastern shore. The temple has a golden, 36 foot tall seated Buddha which was built in 1972. The Buddha is sitting in the Mara pose. This depicts a time on the journey of Buddha’s enlightenment when he fought temptation by the devil Mara by meditating and staying calm. It signifies purity, enlightenment, and steadfastness, all strengths Buddhists and non Buddhists alike often aspire to. You can find a courtyard with vendors at the base of the statue. In this area, there are food stalls, restaurants, and vendors of religious items, amulets, souvenirs, and clothing. A walk around the area will bring you to two more Buddhas inside pavilions. Wat Plai Laem is also a temple on Koh Samui. It was built in 2004, and features Tha-Chinese as well as traditional Thai architecture and a 90 foot tall statue of a fat, laughing, Chinese Buddha. In Chinese Buddhism, this statue represents wealth and prosperity. It has been painted in bright colours of red, white, and gold. 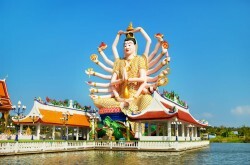 Another large statue at Wat Plai Laem is the 18 armed Guanyin, who is the Chinese Goddess of Mercy and Compassion. She is also known as Phra Mae Kuan, and is known as the protector of women and children, the sick, and the poor. As a relatively modern-built temple, you will note that Wat Plai Laem features bright and festive colours on all of its buildings. Inside the buildings you can take an opportunity to check out pictures which tell stories of Buddhist mythology and learn more about the traditions of the faith. There is a small lake on the temple site, and for a little fee you can feed the pond fish which live in its waters. The Namuang Waterfall gets its name from the purple shades of the nearby rock faces. Namuang is purple in Thai. This area is considered popular for family swimming, and at the side is a Safari Camp where you could try an Elephant ride through the jungle. 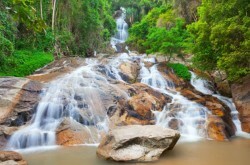 Namuang Falls is comprised of two cascades, and is located 7.5 miles south east of Nathon Bay. From the entrance to the area, take a walking path to the falls. The first waterfall that you will reach is called Namuang 1 and goes into a natural pool which can be used for swimming. Travel a half hour further up and you can find Namuang 2 which is smaller but also refreshing. In the area you can also find vendors selling snacks and food. If you are in relatively good shape, the walk will be easy. Make sure to wear sturdy shoes as the paths can sometimes become slippery. The Secret Buddha Garden was built by a 77-year-old former durian farmer named Min Thongsuk. He put a few statues of Buddha in different poses around his land, and kept building on the garden until he died fourteen years later. What was once the farmer’s land is now the Secret Buddha Garden, which is a private space that can be viewed on payment of an admission fee. 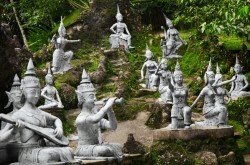 Statues are located in the trees and flowers as well as waterfall, stream, and jungle. Some statues are obvious while others are hidden in foliage, waiting to be found by intrepid visitors. The statues relay tales from Buddhist folklore and myths, and a guide will explain them to you as you go along. The area has beautiful views of the Island. Although it is a steep and rocky dirt road, accessible only by four-wheel drive vehicle, the two-hour journey can be worth it for many adventurers. Known as the ‘rude’ rocks, Hin Ta and Hin Yai are natural rock formations that took thousands of years in the making. The two rocks, known as the Grandfather and Grandmother rocks, simply put, appear to many people to look like male and female genitalia. The view is incredible along the eastern coastline where the rocks are located, and you can find a market along the path to the rocks. At the market is one of the few places to buy a sweet treat that is traditional to Thailand. It is called galmae, and is made from caramelised coconut. Enjoy the white-sand beach, although it is not recommended as a swimming spot, it makes a good rest stop on the walk. The water is so clear that you may be able to see lots of different plants and fish in it. 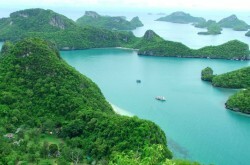 The marine park consists of 42 Islands in the central Gulf Coast area of Thailand. Most of the 42 Islands are close together and feature beautiful beaches, jungles, forest, and rock formations, which can be seen by boat and make good photographic opportunities. It is located just north west of Koh Samui, and the main buildings in the park are on the Island Ko Wua Talap. There is also a tourist information centre, restaurant, tourist bungalows, and a famous view point. You can see the Buaboke Cave or either of the two beaches, which are on opposite ends of Ko Wua Talap. To get from one beach to the other, following a rope strung along the trail which goes through the jungle. It is not an easy walk, but it only takes 30 minutes. Take a ferry or speedboat to get to the Angthong National Marine Park, and pay an entrance fee to enjoy the natural areas. You may be able to spot butterfly fish, parrot fish, black tip reef sharks, groupers, blue swimming crabs; sea whips, oysters, and coral. The park is also used as a breeding ground for Mackerel. Visit the Mummified monk of Koh Samui, a man known as Loung Pordaeng. The Wat Khunaram Temple has been built as a special place for the mummified body of what is considered Koh Samui’s most famous monk. Although it can be uncomfortable, or disturbing to find the body kept in an upright glass casket in a specially built room of the temple, keep in mind that to the Thai people, the monk is there as someone to worship. In Thailand, death can be seen as a chance at a better life in the next life. 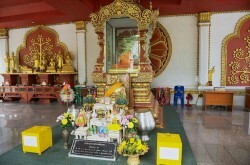 The monk is surrounded by flowers, incense, candles, and fruit offerings. While it isn’t known exactly when he became mummified, Loung Pordaeng was born in 1894 in Koh Samui. After becoming a monk and then disrobing to get married and have a family, Pordaeng returned to the faith at the age of 50 once his family was grown.